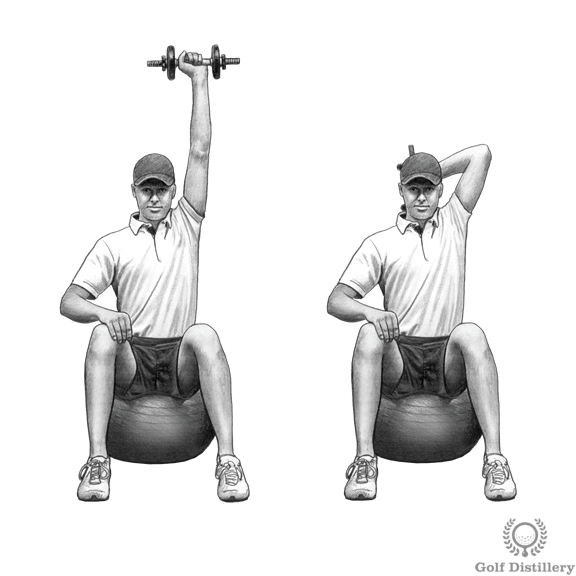 The golf strength exercises below will allow you to hit the ball significantly further and with less effort. Research from Sports Scientists has shown that golf-specific strength training can increase a your swing speed and shot carry distance – without any negative effects on accuracy or ball striking. 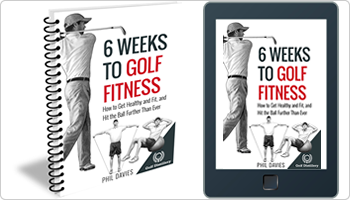 Improving your core strength will help to improve the mechanics of your golf swing (you’ll have better control over the co-ordination of your body). 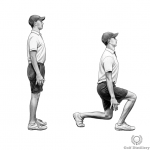 Couple that with improved posture and it can all add up to significantly lower scores on the golf course. 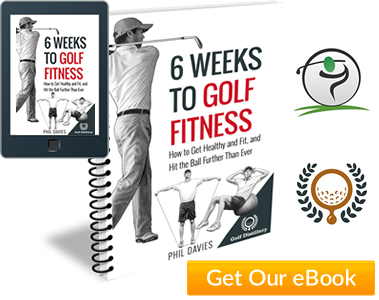 And a well-designed strength training plan is one of the best ways to prevent nagging golf-related injuries that can keep you away from the golf course when you want to play most. Place a stability between your lower back and a wall. 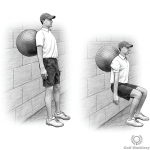 Place your feet 2-3 feet in front of the wall so that you feel as though you are leaning back into the ball. Legs should be straight, feet shoulder width apart. Lower yourself down by bending at the knees until your thighs are about parallel to the ground. Your feet should be far enough away from the wall so that you feel like you are sitting back on your heels. Your lower leg should be at 90 degrees to the floor. Hold this position for the required amount of time and return to a standing position. Increase the difficulty by holding dumbbells in either hand. Holding a dumbbell in either hand, lie with your shoulders on a stability ball and make a ‘bridge’ with your torso and thighs (i.e. torso and thighs should make a straight line, lower legs at 90 degrees to the floor). Hold dumbbells directly overhead with arms slightly bent at elbows. 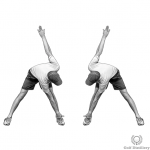 Open arms out in a crucifix position until they are roughly parallel to the ground and return back overhead. Elbows should remain at a fixed, slightly bent angle i.e. don’t bend elbows further during movement. Fix a resistance band to top of door / door frame using an anchor. Stand side on to door and reach up to grab band. Wrap band around hands until there is only a small amount of slack while your arms are overhead. 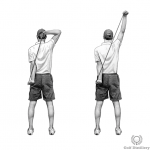 Keeping arms straight, pull the band down and across body by rotating torso (feet stay in a fixed position). 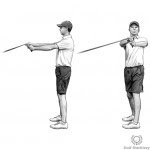 Pull band down towards opposite hip pocket, pause for a count of 1-3 and return to the start under control. Stand with a dumbbell in either hand, feet shoulder width apart. Step forward with one foot allowing back knee to bend. Plant front foot on floor so that front lower leg is at 90 degrees to ground. Back knee should almost touch floor, toe kept in contact with the ground. Push off from front foot to return to start. 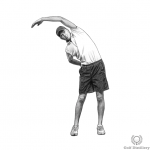 Keep upper body straight and upright – don’t bend at hips. Avoid letting front knee deviate from side-to-side as it bends. Form a push position but place weight on forearms instead on hands. Focus on keeping entire body in a straight line – avoid letting the hips sag / lower back arch. 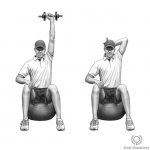 The difficulty of this exercise can be increased by lifting one off the ground, one arm off the ground (place outstretched like Superman), or by placing feet on a stability ball. Stand with feet shoulder width apart. Squat down until thighs are almost parallel to ground and twist to one side pushing arms out to front as you do. Return to start and squat down again, twisting to opposite side. When squatting, keep feet flat on ground and feel as though you are sitting back slightly on your heels. Hold dumbbells to increase the difficulty of this exercise. Lay flat on back, knees bent, feet flat on floor. Remember to breathe whilst holding this position! Stand and hold the dumbbells with your hands palms facing each other. Curl dumbbells up making sure to keep upper arms fixed into sides. Pause at the top, lower and repeat. Holding a dumbbell in both hands, lie with your shoulders on a stability ball and make a ‘bridge’ with your torso and thighs (i.e. torso and thighs should make a straight line, lower legs at 90 degrees to the floor). Hold dumbbell directly overhead with arms slightly bent at elbows. Keeping arms straight, turn shoulders to one side until arms are about parallel to floor (or as far as is comfortable). 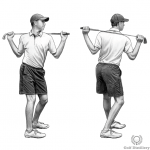 Avoid letting hips turn – twist should come from shoulders and torso. Return to start and repeat to other side.